AAA Mid-Atlantic says the average price of regular gasoline in New Jersey on Friday was $3.55, up 5 cents from last week. That's also much higher than it was a year ago, when motorists were paying $3.09. Meanwhile, the national average price rose 12 cents and is now $3.65. That's also much higher than the national average from a year ago, which was $3.23. The price boost marks the twelfth straight week that gas prices have risen in New Jersey. Analysts say the rising prices are mostly due to tensions in the Middle East, rising crude oil prices and market speculation. 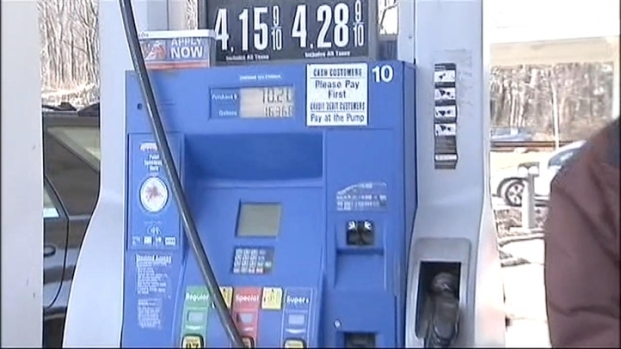 Experts say drivers should get ready for a spring and summer of very high prices at the pump. Gas prices have never been higher at this time of year, and they're certain to go up, before they go down. Roseanne Colletti reports.